Good news! The official soundtrack for Horizon Zero Dawn hits Spotify today, available now on PlayStation Music. 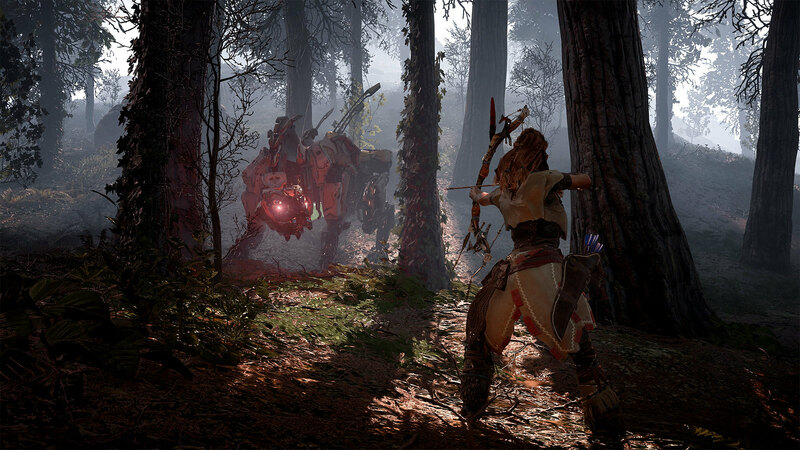 With its driving tribal rhythms and stirring vocal performances, the Horizon Zero Dawn soundtrack is a huge departure from Guerrilla soundtracks of yesteryear. Listen to the full album here, a week before it’s available anywhere else. In honor of the soundtrack release, we caught up with the entire composer team – Niels van der Leest, Joris de Man and The Flight – as well as Vocalist Julie Elven and Guerrilla’s Music Supervisor Lucas van Tol, to talk about how this memorable musical collaboration came to pass. PlayStation.Blog: What inspired this musical collaboration? 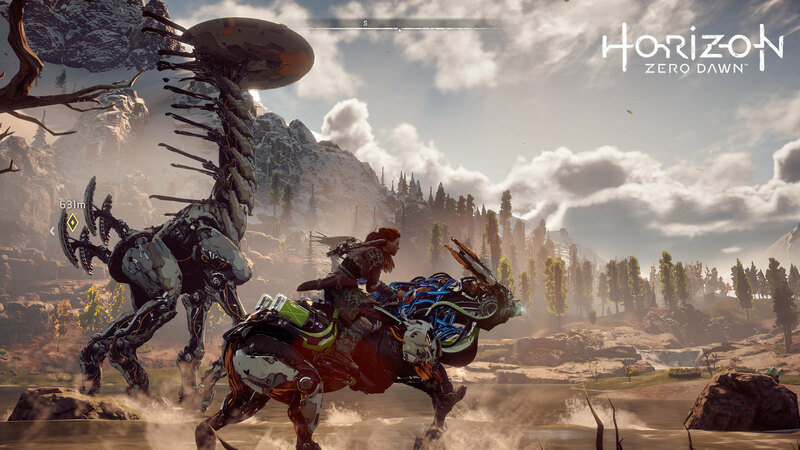 Lucas van Tol: When I started working on the music we didn’t have a game to score against, so we decided to focus on Horizon’s three main pillars: machines, tribes, and beautiful nature. PSB: How did you go about answering those questions? Lucas: Well, we knew we were in way over our heads. So we brought in some outside help, starting with Niels van der Leest. Niels van der Leest: Lucas and I had actually met a couple of months earlier at a recording session for sound designers. He learned that I studied percussion, so when he contacted me, he asked me to research what the tribal music of Horizon might sound like. In July 2014, I presented my findings to the game director, the writers, and the designers, and they liked it so much they decided to put me on the ‘diegetic’ (in-world) music for the game. Lucas: So then we had our first composer. However, we also knew that we’d need a certain amount of music in our game, which would require multiple composers. PSB: How did you find the remaining composers for the project? Lucas: In late 2014, we approached an old friend of the studio, Joris de Man, with whom we’d worked on Killzone 1, 2, and 3. Joris de Man: Lucas contacted me and said that they were working on a new game. I was immediately interested because I’d heard that it was going to be different from Killzone, and I was curious to see what they’d been up to. So we had a conversation and he asked me if I wanted to pitch on this job and put some music forward. The studio set me up with some artwork and a synopsis of what the game was about, and I was quite blown away; the scope was really ambitious, a clear departure from what I’d been used to seeing from Guerrilla. Lucas: The idea we had back then is that Joris would focus on the ‘beautiful nature’ pillar and Niels would take care of the ‘tribes’ pillar. That meant we still needed someone to cover the ‘machines’ pillar. Which is where The Flight came on board. PSB: Who, or what, is The Flight? Alexis Smith: The Flight is a musical duo consisting of Joe Henson and myself. We’re record producers and artist producers and songwriters, but we’ve also done a few games; the last one was Alien Isolation. Through our agent we heard that Guerrilla was looking for additional members on the composing team for their new project. We’d known Joris de Man for a long time, and we thought it’d be fun to work with him. So we got in touch, had a video chat with Lucas, and then did a pitch. Joe Henson: What Lucas was able to show of the project looked amazing. Coming from the dark, claustrophobic atmosphere of Alien Isolation into the lush, open world of Horizon was incredibly exciting. Although both games belong to the science-fiction genre, they’re almost polar opposites in that respect. Well, apart from both having a strong female lead. 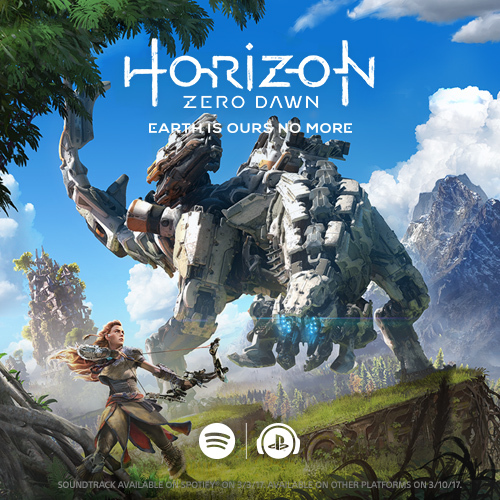 PSB: The E3 2015 trailer theme was the public’s first taste of Horizon’s musical score — how did it come about? Joris: As Guerrilla was already working on the game, we had to come up with a memorable theme for the game itself, but also for the E3 trailer. Because the composers mostly worked remotely, we would have weekly video chats about where the music was going. During one of those chats I was talking to Lucas, and as he explained what they were going to show in the E3 trailer, the idea for the theme just popped into my head. I told him “Give me a second” and quickly ran upstairs to my studio to put something down on the piano. PSB: Is that also where vocalist Julie Elven became involved? Joris: Yes. What I heard in my head was a female voice, and I thought – Aloy is a strong and kind female character, so it would be nice to have a female voice that can be strong and gentle at the same time. I called around to see if I could find this voice, and incidentally a composer friend of mine was actually just working with Julie at the time. He said, I think I’ve got the perfect person for you. We did a little test, and Julie just nailed it instantly. Julie: It was actually quite funny, because I’d only recently started doing vocal performances for video games. Prior to that, my vocal performances could mostly be heard in trailers and film scores. When Joris contacted me I was actually slated to sing for a video game score by Ian Livingstone the very next day. It was quite spontaneous – Joris turned up and was like, “Hey, I don’t know you but would you be interested in doing this?” And just like that, I was suddenly involved in two different video game scores. After E3 we worked on more of the music together, especially on the other trailers as well as the cutscenes of the game. Our focus was to give a musical voice to Aloy’s emotions through the singing. Aloy’s story tells us about her search for identity, about great loss, but also about the courage to overcome obstacles and to persevere. These aspects were very present for me personally, and in my vocal work I aimed to express both the vulnerable and lonely as well as the strong and resilient facets of Aloy’s internal world. PSB:What are your overall thoughts on this collaboration? Niels: It was a tremendously fun and rewarding experience. Creating a whole new musical history for the world of Horizon Zero Dawn took some research and trial and error, but it worked out great. Joe: It was also a pleasure to work in a team with the other composers, and with the creatives at Guerilla who were so dedicated to their unique vision. The colors, the machines, the fall and rebirth of mankind; these were all deeply inspiring to us as composers. Joris: Overall, I feel it’s been an absolute joy to rise to the challenge of plotting Aloy’s journey musically, and to follow the roads less travelled. From bowed dobros and guitars to fujaras, live strings, massive taiko drums and circuit-bended synthesizers, I hope players will enjoy the soundtrack as much as we had making it! It would be really nice to get it elsewhere, as well. Like Google Play Music. It’s an amazing soundtrack and deserves to reach as many as possible. Or at least Apple Music considering their subscription numbers…. It’s immaterial. Next time they should consider their fans instead of money from Spotify. Plenty of us would have paid for it at launch. It’s like the Collector’s guide I ordered – not arriving until March 14. The game is incredible but the head of the marketing department is an idiot. I’ll look forward to next week, when I can add it to my Amazon Music playlist. Until then I will get my fix of the amazing soundtrack by playing the game. Just added this to my spotfy play this morning. Thank you for adding it to Spotify! Awesome soundtrack. So what other venues will it be available on come this Friday? iTunes, I’m sure. Anyone else? Amazon? Playstation Store as an app with MP3 downloads baked in? This early exclusivity thing with Spotify stinks. It really should have come out on all platforms simultaneously. I’d rather listen to better quality than limited streaming on a service that’s trying to sell me on a subscription when there’s already too damn many subscriptions going after my cash (including PS+). This soundtrack is absolutely amazing. While I’m all down for availability on OTHER streaming services once the week exclusivity is up it certainly deserves a lossless and/or physical release. I was hunting for the sound track on day one. In iTunes for purchase? No. On the PlayStation store as downloadable app that creates MP3’s that I can put into iTunes so they sync into iCloud music library? No. Looks like I have to wait another week. Wow. I don’t use Spotify. But I just created a free account – I can only shuffle. Why launch it on a service exclusively where I can’t even listen to the tracks in order? Pfft. I want to thank Sony for releasing what appears to be the complete score to the game. Much appreciated, really! That said, I would welcome if it was available in hi-res format (FLAC 24-bit/48kHz) elsewhere other than 7digital, like Qobuz. 7digital is out-of-reach for me, but I can still use Qobuz to buy it. Music ok as long its not like Horizon zero dawn Music inspired by aloy on spotify its ok for me thats a insult to the game can’t even play spotify during gameplay its blocked for some reason. If anyone from SIE/SCE reads this, please, please, release this magnificent soundtrack in lossless quality (24bit/48kHz) on Qobuz, too. It also allows lossless downloads. Let 7digital not be the only digital music outlet that carries it. I am very willing to buy it but have nowhere to do so. Will this be released as a physical disc release? PLEASE say yes! I don’t do digital music (unless I am able to obtain a physical copy).